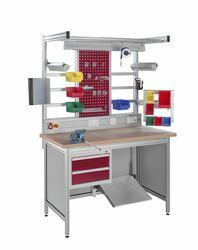 Our range of products include Assembly Line Workstation, Double-Sided Working Bench, Electronic Workstation, Lean Workstation, Machining Centre Workstation and Mechanical Workstation. Assembly Workstation Systems In Phoenix Mecano Aluminum Profile. Looking for ASSEMBLY LINE WORKSTATION SYSTEMS ?